Reviews the book "Fierce Gods: Inequality, Ritual, and the Politics of Dignity in a South Indian Village," by Diane P. Mines. This is publisher's final PDF. This article was originally published in Magic, Ritual, and Witchcraft and is published by University of Pennsylvania Press. Gamburd, M. (2009). Diane P. Mines. Fierce Gods: Inequality, Ritual, and the Politics of Dignity in a South Indian Village. 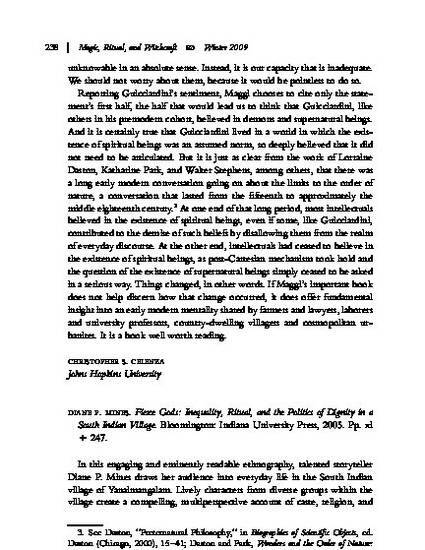 Magic, Ritual, and Witchcraft 4(2): 238-241.